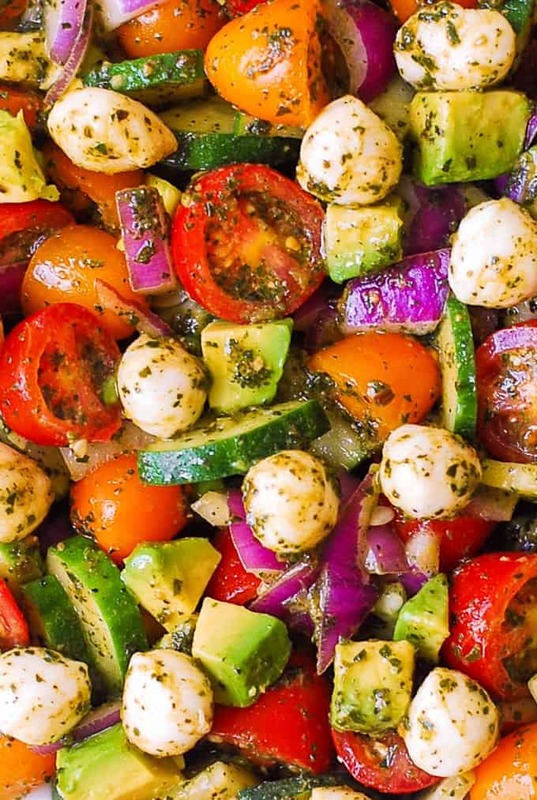 Avocado Salad with Tomatoes, Mozzarella, and Basil Pesto – healthy recipe packed with nutrients and lots of fresh ingredients! Perfect Spring and Summer salad! 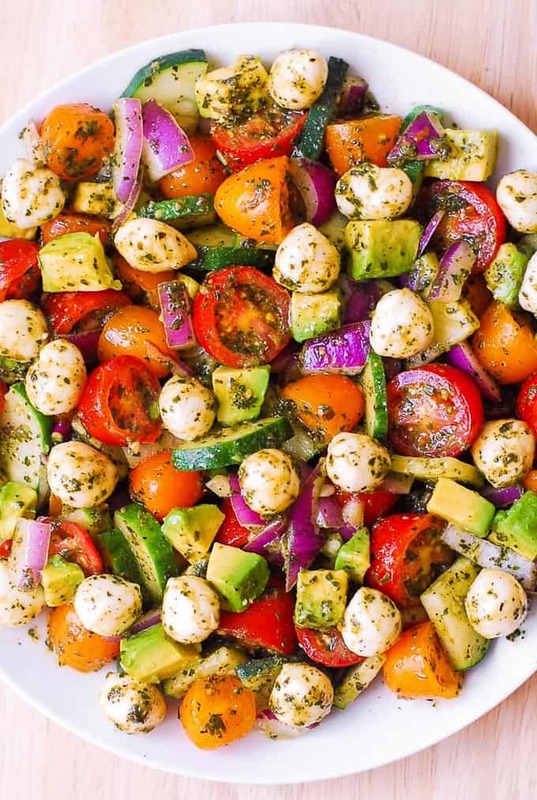 Small fresh Mozzarella cheese balls are delicious when combined with avocado in this easy salad that also features red and yellow cherry tomatoes, cucumbers, and red onions. The dressing for this avocado salad couldn’t be easier to make – just combine fresh basil pesto with lemon juice! Basil pesto makes a perfect salad dressing as it is packed with olive oil. One of many reasons that I love Summer is that it’s a perfect time of the year to make salads. I’ve been making all kinds of salads, including my favorite beet salad with spinach, goat cheese, and cashews and strawberry spinach salad. Well, now I’ve got another favorite! This recipe just screams Summer! 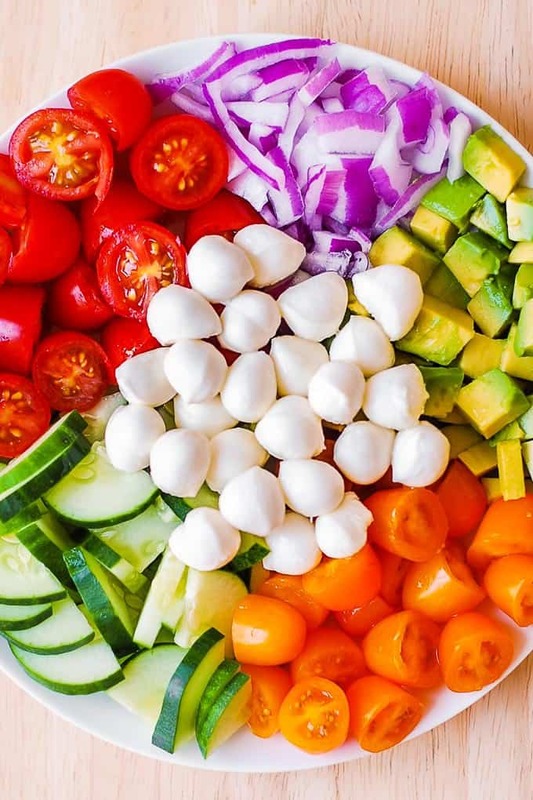 I love using red and yellow cherry tomatoes (each sliced in half) in this avocado salad because they add natural color and look really good with the small fresh Mozzarella cheese balls and other diced ingredients. So easy to make! Just combine all the ingredients together, toss with a simple basil pesto dressing and the salad is ready! My favorite salad dressing for salads is just plain olive oil. Which is why basil pesto (which has olive oil as one of its ingredients) makes a perfect salad dressing for my avocado salad. To make the dressing, just combine fresh basil pesto (I used 1/4 cup) with 1 tablespoon of lemon juice. After you add the dressing to the salad, season the salad with salt and pepper, to taste. I used to make my own basil pesto all the time, but these days you can buy really good pre-made fresh basil pesto in the store, so I just used store-bought basil pesto for this avocado salad. 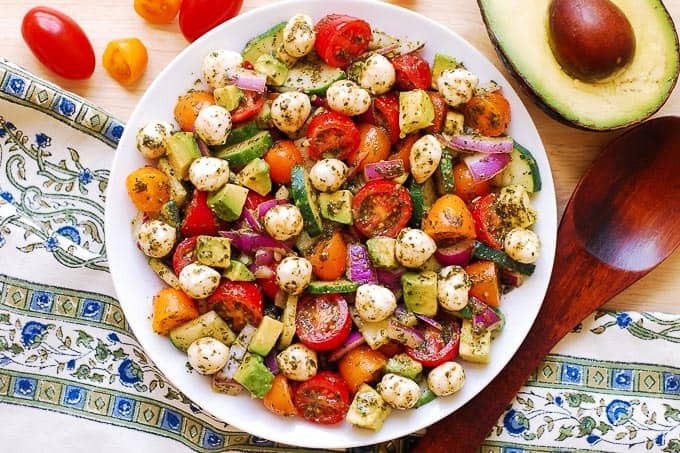 Healthy and delicious Spring and Summer salad: Avocado Salad with Tomatoes, Mozzarella, Basil Pesto. 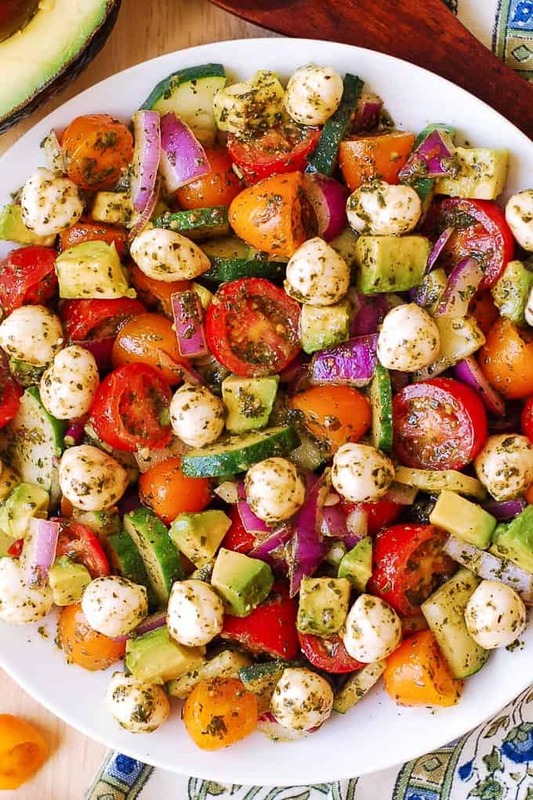 Simple recipe that uses fresh ingredients: tomatoes, cucumber, avocado, fresh small Mozzarella cheese balls, red onions, and basil pesto dressing. 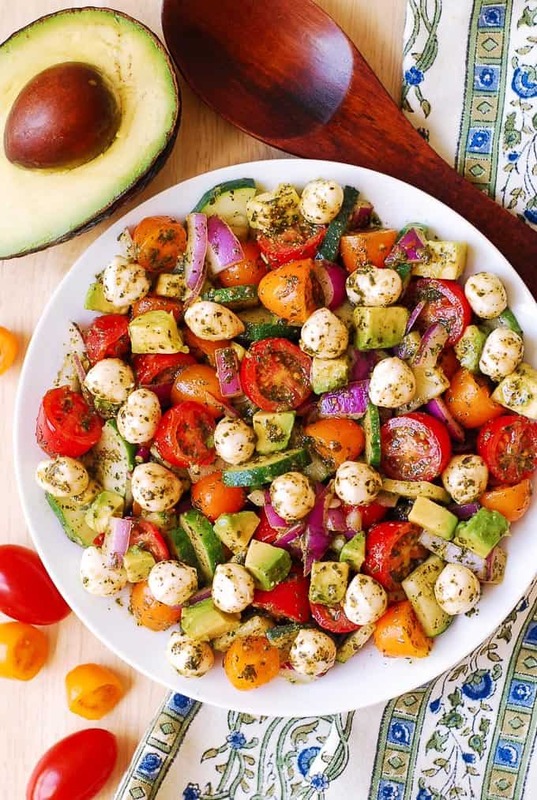 In a large bowl, combine halved red and yellow cherry or grape tomatoes, diced avocado, sliced cucumber, diced red onion, small fresh mozzarella cheese balls. Super yummy, a great summer meal not just a salad. Yes, it makes a great lunch! Entertaining 30 family members on Friday. I am looking forward to serving this gorgeous salad. I may make 2 or 3. Thank you. Delicious! I added 2 cups cooked bow tie pasta and 1 orange bell pepper chopped. Thank you! Those are great additions! I love your salad recipes. Where do buy such little mozzarella balls ? I bought these at Whole Foods if I remember correctly. Made this yesterday, and everyone loved it. Makes a large size bowl, plenty for a potluck. 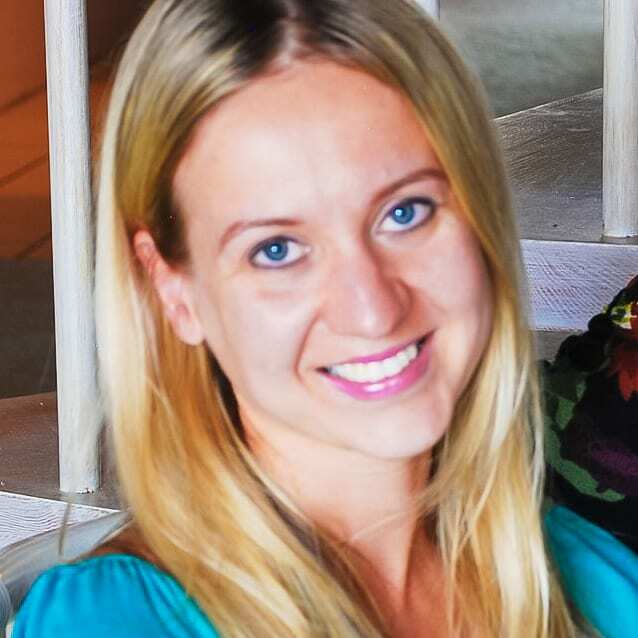 Julia, thank you for sharing this recipe! Will be making this again soon. Because of the nature of this salad it’s better to make just enough not to have leftovers. Otherwise avocados will turn brown, Mozzarella cheese would not be as bright, and other veggies could get soggy.